Like most of you girlies (and maybe guys) reading this, I love a good old pamper. I probably write more about pampering and cosy nights in than anything else at the moment - I'm getting old before my time I tell ya! On the top of my list of things to do when having a good old pamper is a hair mask. I love jumping in the shower for a relaxing 15-20 minutes and treating my hair and scalp to a thick and creamy treatment mask. 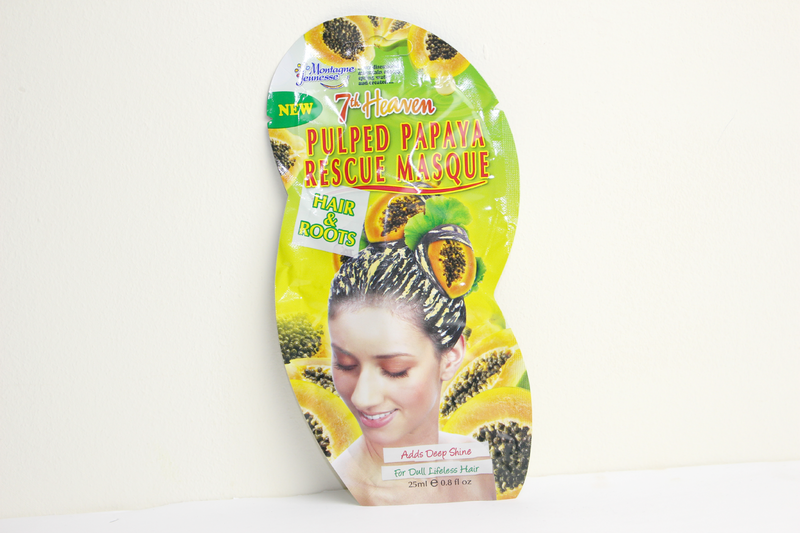 7th Heaven are always my go-to brand for face masks, at only £1 each and with something for every skin type you can't really go wrong, so when I heard that they were now creating fabulous sachets for hair I couldn't wait to try one out! This is the Pulped Papaya Rescue Masque - a fabulous blend of potent botanical oils and papaya fruit that help to moisturise the roots and hair shafts. Plus the creamy formula tackles dullness and frizz, transforming your hair back to its full shiny, healthy glory. I'm going to start with the one negative comment I have... and that is that, for me, there wasn't enough product. To have my hair covered root to tip in an even amount I would have needed just a little more than what was in the sachet. So if you have long hair you may need more than one sachet. I squeezed out as much product as I could, covered my hair root to tip and left it while I went about my shower business for about 4 minutes. The scent was lovely, a real strong fruity smell which lasted even after the mask had been washed out and my hair was dry. Afterwards my hair felt so light, clean and knot free - I could even run my fingers through it straight after hoping out the shower.... this does not happen alot haha! I really did notice an extra shine to my hair and an improvement with the dullness - which is something I'm really struggling with the moment as I'm waiting for it to be coloured next week! I'm so pleased with the results from this mask, for £1 this is the perfect pick me up and I cannot wait to try out the others from 7th Heaven. Check out the mask - here - it's a barry bargain! Oddly I have never used a hair mask, although I use face masks a lot. I really like the sound of this and for £1.00 what more could you want. Glad this was so good - seems like great value for money. Mmm, I love fruity scents (especially on hair) and what a fab price!